Roman blinds continue to increase in popularity, adding a touch of class to the surroundings they are hung in. Bubbles Blinds offers a great range of fabrics, both plain and patterned. All of Bubbles Blines romans are supplied with deluxe headrails which have a continuous chain control, doing away with the need to "Tie down" cords to a cleat. 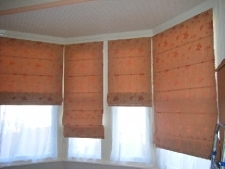 Roman blinds can come as roman shades (unlined), romans with standard linings or blackout romans with a black outlining.